Slightly less impressive than the 2001, but still excellent is the 2000 Cotes du Rhone Coudoulet blanc. Made from a similar blend, it exhibits additional mineral and fewer fruit characteristics than its younger sibling. Offering hints of apricots, honeysuckle, and rose petals, it is a delicious white to consume over the next two years. 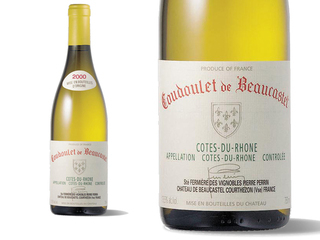 A delicious blend of 30% Viognier, 30% Marsanne, 30% Bourboulenc, and 10% Clairette that sees no new oak, the 2000 Cotes du Rhone Coudoulet white offers exotic ripe apricot and floral scents, fat, low acid flavors, good freshness, and abundant fruit. Given its powerful, low acid style, it should be consumed over the next 2-3 years.